Shari’a is the collection of Islamic law that developed and was enlarged upon over a number of centuries. In Islamic society, fiqh, jurisprudence, was considered the queen of sciences and was held in extremely high esteem. Under the Abbasids Shari’a evolved as a codified system of Islamic law. The Shari’a was based on the word of God as given through the Qur’an, Hadith, and Sunna. The compendiums of law included aspects of customary tribal law as well as religious law as given in the Qur’an. In spite of variations in interpretation, the Shari’a united Muslims across continents and influenced every aspect of their lives. Much of the law dealt with family matters (marriage, divorce settlements, inheritance) but also provided guidelines for the treatment of slaves, business matters, usury (forbidden), and the oversight of waqf (plural awqaf), or religious foundations. 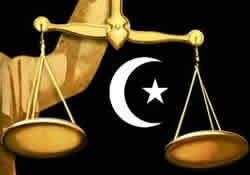 The law implied, in varying degrees, some measure of ijtihad, human judgment or interpretation. In Islam as in Christianity, scholars and theologians debated the degree of independent thinking allowed. Some permitted a greater degree of human interpretation while others argued that the sacred texts were to be implemented literally word by word. The ulema, Muslim scholars, provided interpretations of the texts based on extensive research and study. Qadis, well-trained judges, were appointed by local rulers to pass judgments and issue verdicts on specific cases. When jurists could not agree on an issue or case the muftis or a so-called Sheikh al-Islam delivered fatwas or legal pronouncements. The issues dealt with in fatwas varied from weighty theological matters to matters of dress or the legality under Islam of drinking coffee. Muslim scholars were divided over when or if the gates of ijtihad closed. Many held that by end of the 12th century ijtihad was no longer permissible; however, others argued that independent thought was an ongoing process and that the law was constantly being reinterpreted and reassessed. Qadis often engaged in taqlid or imitation of earlier judgments. By the 1300s there were four recognized schools of Sunni law. The Shafi’i, named after Muhammad Idris ibn al-Shafi’i (d. 820), was applied in Southeast Asia and much of Syria, Palestine, and Jordan. The Maliki, after Malik ibn Anas (d. 795), was fairly conservative in its interpretations and became prevalent in Egypt and North Africa. The Hanbali, after Ahmad ibn Hanbal (d. 833), was the most conservative and mandated the strict adherence to the letter of the law. It became the law applied in modern Saudi Arabia. The Hanafi, after Abu Hanifah al-Muman ibn Thabit (d. 767), was considered the most liberal of the schools of law. Hanafis used ra’y, or opinion, and questioned many of the Hadiths; it was adopted by the Ottoman Empire and became the most widely applied school of law. Technically a Muslim could choose any one of the four schools but in practice nation states tended to apply a single one and individuals usually followed the one applied in their nation-state. The Shi’i in Iran evolved their own legal codes implemented through mullahs, the established clergy. Among Shi’i scholars, as within the Sunni community, there was a lively debate over ijtihad. Among the Shi’i the debate continued into the 17th century with the community generally following the guidance of the imams on issues of interpretation and practice.